In Alaska and other areas of the circumpolar north, women have been working in the last decade to revitalize a tattooing tradition. Grete Chythlook dreamed of the tattoo before she had ever seen one in person: a few fine lines drawn from the bottom lip down to the tip of the chin. 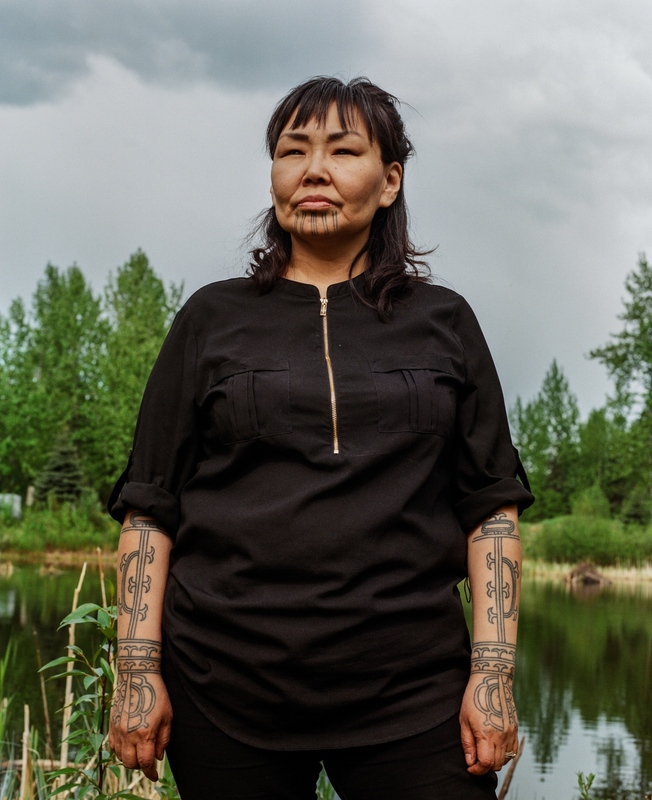 “I didn’t know anybody who had a chin tattoo,” she said, “whether Inuit, Gwich’in or any other group.” So when a friend asked her to accompany her to a tattooing session, and the design matched her vision, she sensed that something special was happening. These line tattoos speak to a practice that dates back at least 10,000 years and is now being revitalized by Alaska Native women who want to reconnect with the traditions of their ancestors. These tattoos were traditionally inscribed on women’s skin by women’s hands to commemorate various achievements and points in a woman’s life, such as one’s first menstrual period, the mastery of a new skill and childbirth. 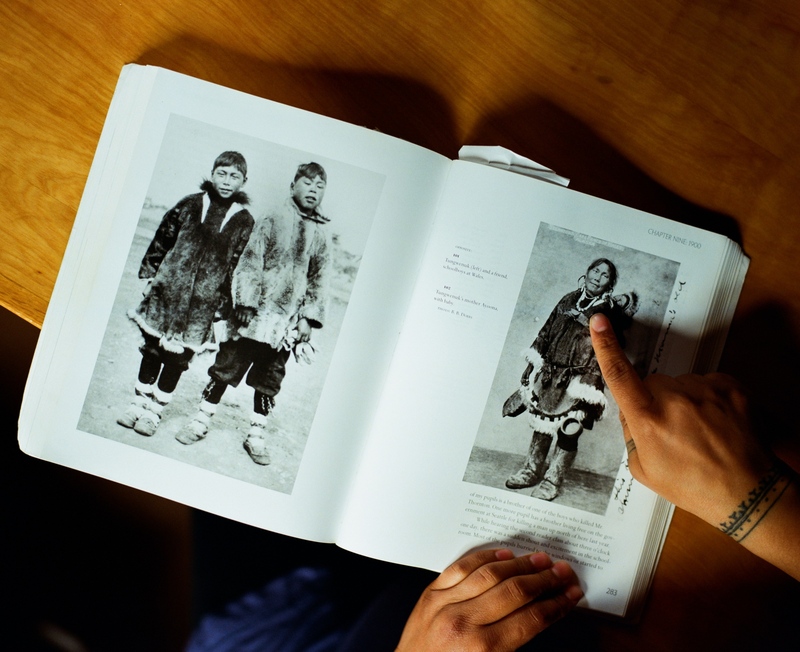 But as Western colonization swept Alaska in the 19th and 20th centuries, including the establishment of boarding schools where indigenous languages would not be spoken, many Alaska Natives were prohibited from practicing the rituals that had bound them to one another. Tattooing was one of those traditions. In the last decade, women in Alaska and other areas of the circumpolar north have been working to revitalize the tattooing tradition. For them it is a response to the long-ago efforts to wipe out cultural practices and entire populations of people, and a celebration of cultural resilience. Holly Nordlum has been a voice at the forefront of the movement to revive this practice. Inspired by her great-grandmother, the last woman in her family to have the traditional tattoos, she applied for a Polar Lab grant through the Anchorage Museum in 2015, and with the help of the Smithsonian Arctic Studies Center developed a program designed to educate women and the public about the art of traditional Inuit tattooing. Ms. Nordlum uses a traditional hand-poke method in her tattooing sessions, which take place in homes all around Alaska. One of the things she likes best about her work is its visibility. 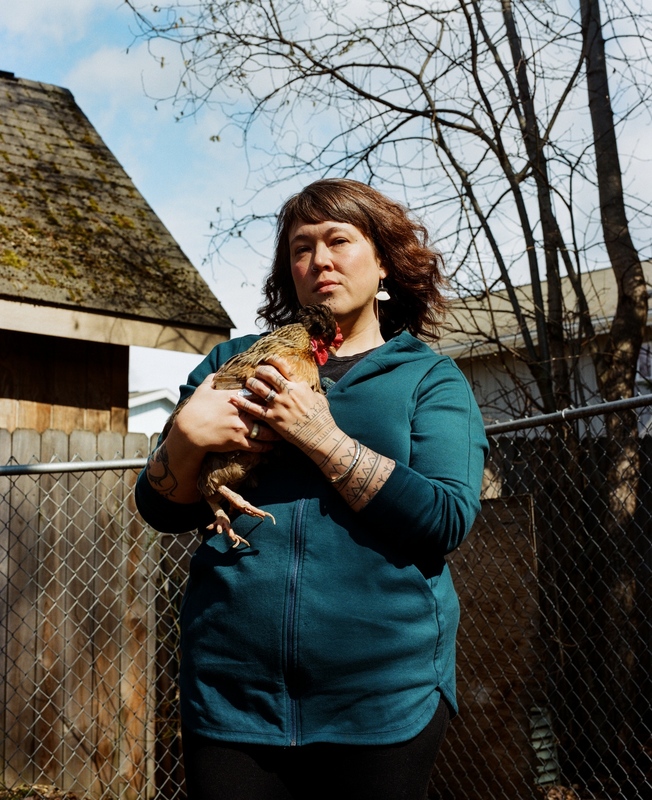 As someone who was often teased by peers for her lighter complexion, Ms. Nordlum sees her tattoos as a counter to the whitewashing of native life. “We all come from white dads,” she said. “We are all a product of that.” The tattoos, she said, are a rearticulation of native heritage, and in borrowing stylistic elements from various Inuit cultures, the practice of tattooing has created a more visible indigenous sisterhood. Historically, the tattoos were applied using bone, sinew and soot or gunpowder. These days the tattoos are applied with bamboo, thread and black ink on a massage table, sometimes with the soft hum of streaming music in the background. Some women cite academic and professional accomplishments, like graduating from college, as occasion for getting their tattoos, while others say that making their Alaska Native heritage visible — so as not to “pass” as white or nonnative — motivated their decision. In fact, for many of these women, the markings are a reminder to speak their native languages and claim other aspects of their ancestry with pride. 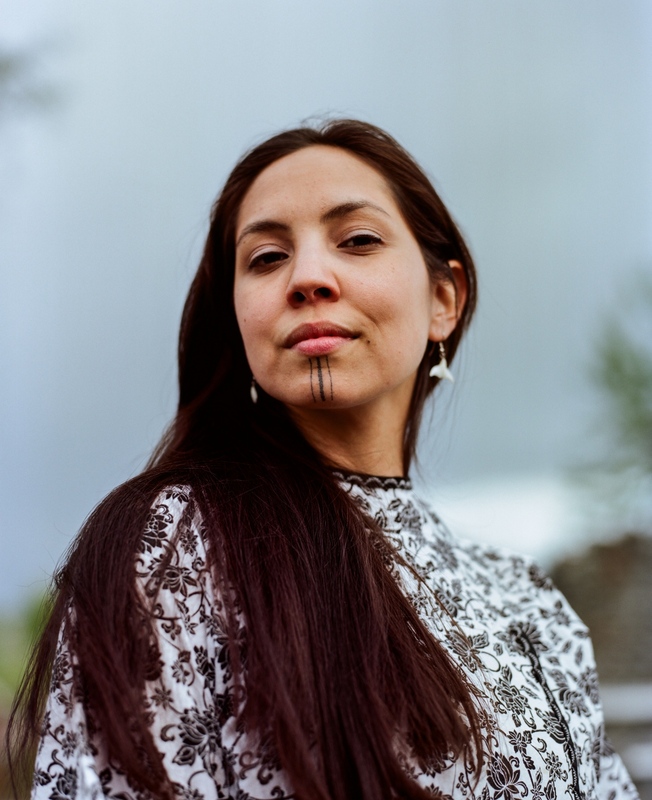 They, like Ms. Nordlum, believe that the connection between their markings and Alaska Native heritage must be made explicit to safeguard their culture against appropriation. As face tattoos have captured the imagination of body-art enthusiasts in recent years, these Alaska Native women hope that these traditional styles can remain their own. Sarah Whalen-Lunn, in her backyard in Anchorage. Whalen-Lunn is a traditional tattooist who learned the practice through a training started by Holly Nordlum and her work with the Smithsonian Arctic Studies Center. "I grew up pretty separated out, so I wasn’t even aware that we had tattooing in our history and in our culture until I started talking to Holly," Whalen-Lunn says. Part of what lead her to getting her own chin tattoo was the realization of that feeling of separation. “I have this conversation with other people often who say, “I thought about getting traditional tattoos but I don’t know my family’s patterns, or I didn’t grow up here--I’m not, I’m not, I’m not, I’m not.' And it’s not about that, it’s about making that reconnection. It’s about that recognition and about carrying that tradition on again. I think that’s a lot of what it is for me, not only a representation to the world but to myself," she says. What the practice means in the larger sense of it has to do with healing and strength, she says. “It was going on for so long, and then it was taken away. And our pride was taken away, and there was a lot of shame surrounding the traditional practices--a lot of shame in not being able to adapt yourself to a modern and different world. So I think a lot of what’s going on with the revitalization of culture now is that there are younger people starting to realize what an amazing culture this is, and the fact that revitalization and reconnection to your cultural practices and tradition helps in healing from trauma—and there’s so much trauma and abuse to heal from. What this very much means for me is a way of healing and restoring pride. And if I can give these young girls reasons to be proud of who they are and where they come from—I want to be a part of that. I want to be a part of bringing something back that should be back, of reclaiming something that we’ve been doing forever." Tattooing is Whalen-Lunn's primary occuptation. She and Nordlum travel whenever they can to other parts of the state to tattoo women outside of the city. A wall inside of Whalen-Lunn's studio in Anchorage. Holly Nordlum received a Polar Lab grant through the Anchorage Musuem in 2015, and with the help of the Smithsonian Arctic Studies Center developed a program designed to educate women and the public about the art of traditional Inuit tattoing. Nordlum, based in Anchorage, regularly tattoos in the traditional hand-poke method throughout the state of Alaska and has been a very outspoken advocate for the importance of revitalizing tradition within Inuit culture and the importance of decolonization. Nordlum has been a voice at the forefront of an Alaska Native movement to revitalize the cultural practice of traditional tattooing, a practice that dates back centuries but was all but eradicated by missionaries in the 19th and 20th centuries. 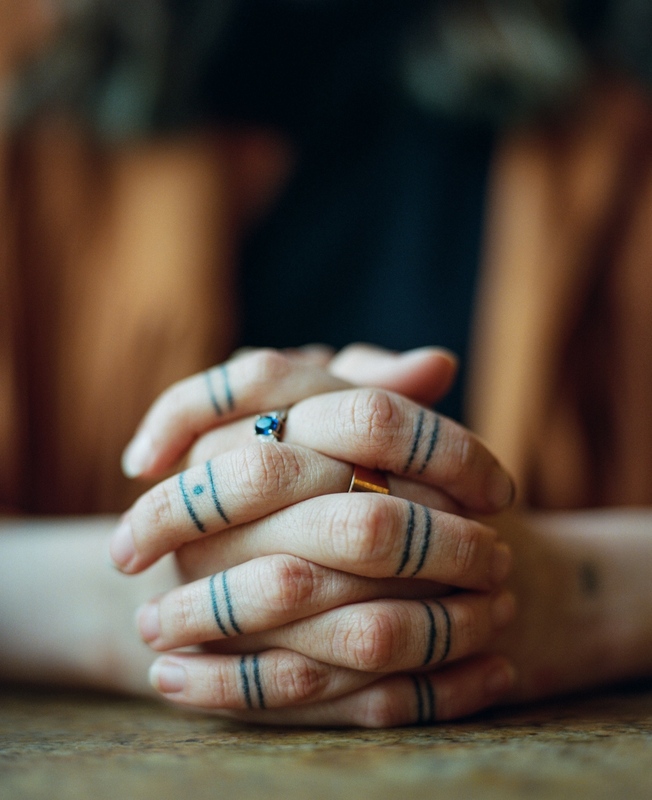 Nordlum says that, to her, traditional Inuit tattooing is something that's hugely personal but also hugely connected to the larger community of Inuit people, and to the visible indigenous "sisterhood" created by the tattoos. "Colonization makes you feel alone and like you’re part of a small group—but we’re a big group. And a big place. And I think it was smart of them to make us feel like a small group in a very isolated area," she says. "For me, I’m just trying to promote healthy Inuit lives and that sisterhood around the globe of Inuit people." A wall inside of Nordlum's studio in Anchorage. Marjorie Tahbone inside her home in Fairbanks. Tahbone is a traditional tattooist who is currently working on her master's in Indigenous studies and writing her thesis on traditional tattooing and ceremony, with a personal lens on the tradition’s connection to motherhood. "We as indigenous people have been through a lot in the last couple hundred years. I like to say that this was a tradition that went to sleep. It was something that was put away for a little bit during a rough time in our history, but it wasn’t gone. It was there, on some level, whether it was through photography images or through stories, and it is being reawaken during this time of healing not just for the Inuit women who have been involved in it but for the entire community. And there have been people who have been unsure of this movement, maybe a little scared of how it will be interpreted by other people, non-indigenous people, because there still is this underlying oppression that’s continually occurring within our communities from non-Native people and Native people—lateral oppression and lateral violence is a real thing that’s happening right now and we are working through it. And we are healing from the historical trauma. And one of the ways that we are doing it is through the revitalization of our traditions and our languages. The tattooing is one that’s taken a huge wave of awesome energy all across Inuit country. I’ve never seen anything quite like it as far as reviving our traditions because it really has taken the entire circumpolar north with Canada, Greenland, and Alaska coming together and working on this movement. Each of the reasons vary –they vary between each woman, they have their own personal stories that go with it, but the underlying foundational meaning is strength, is identity, it’s about who we are as Inuit people and that we are still here today. We’re still present, we’re still going to be , we’re not going anywhere and this is a tradition that’s here to stay. It’s something that’s pretty powerful when you think about it,” she says. Marjorie Tahbone gestures to a photograph of her great-great grandmother, who also had the chin markings, Ayona. 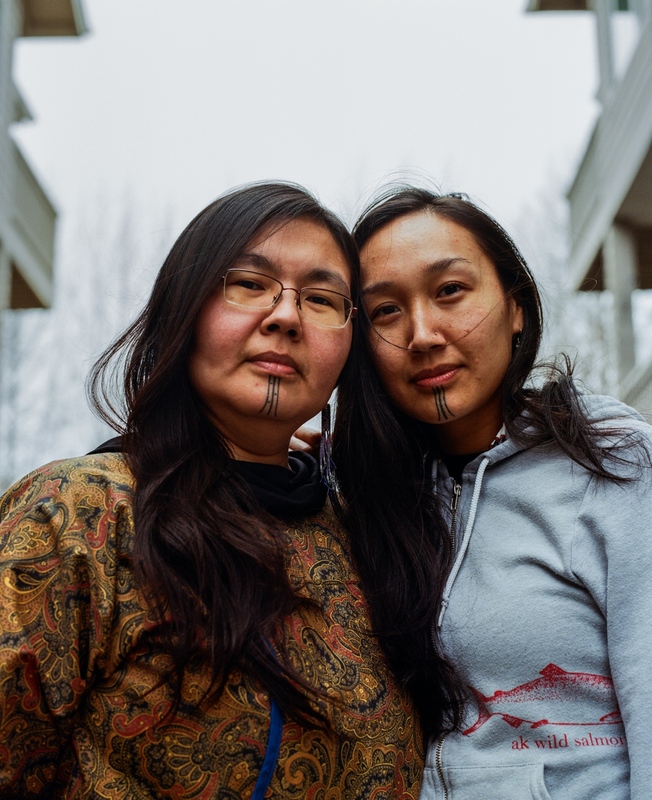 Mellisa Johnson Heflin, who goes by her Inupiaq name Maktuayaq, 39, and Charlene Aqpik Apok, who goes by her Inupiaq name, Aqpik, 33, outside of Apok's home in Anchorage. The two women were in a master's program together, and say that they would stay up late talking to one another, and on one night, the conversation of traditional tattoos came up. The two women went to get their tattoos together at a tattoo parlor, before women like Nordlum and Whalen-Lunn were reguarly doing the hand poke method in town. 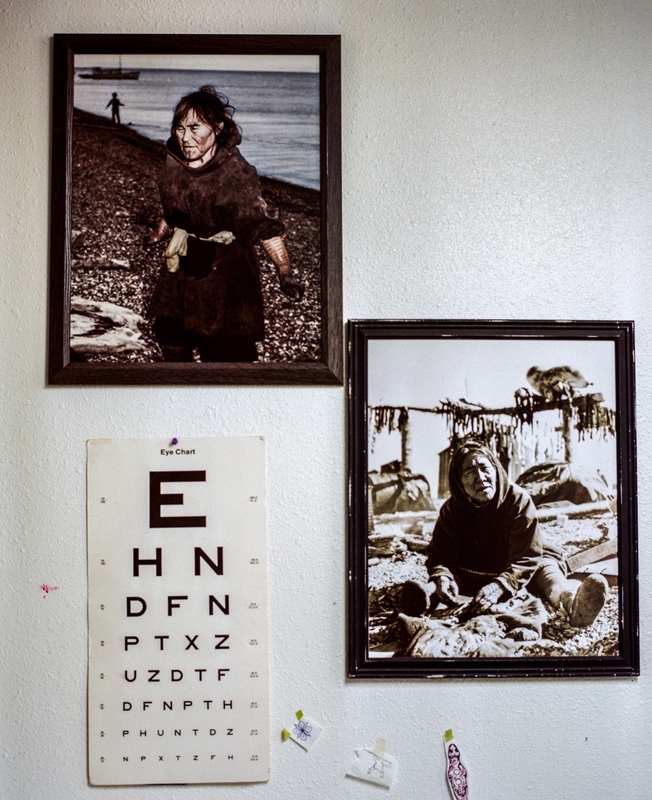 Both women teach Inupiaq in addition to holding positions at demanding full-time jobs (Heflin is the Executive Director at and Bering Sea Elders Group and Apok is a Researcher at Southcentral Foundation), and for each there is a strong connection to getting the tavlagun and to speaking their indigenous language. “There’s so much to it," Apok says. "With our creation stories, ceremony, rites of passage, gendered ceremonies, the sisterhood—the sisterhood of this—has been almost indescribable. Our language journey together. The placement of this by my mouth—that is something I would speak to as well in saying that our words are so powerful, and what comes out of our mouths is so powerful—it was a reminder for me to speak my truth, and to not be afraid to speak my truth, and that it’s valid. And also to be mindful to not say anything I would want to take back. It holds you highly accountable for what you speak into existence." 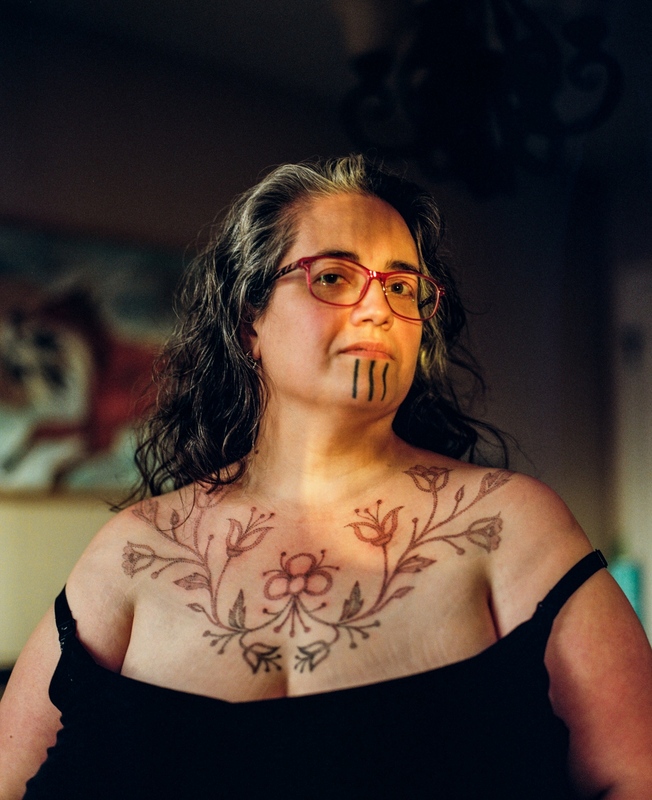 Grete Chythlook 42, in Sarah Whalen-Lunn's home in Anchorage, Alaska, after having a chest piece inspired by traditional beadwork done by Whalen-Lunn. Whalen-Lunn had also done Chythlook's chin tattoo. For Chythlook, that tattoo is both a tangible and also a deeply spiritual thing. She says that before she knew that chin tattoos were a part of her heritage, she was already dreaming of them. “I started dreaming about chin tattoos when I was in my late teens and early twenties, and at that time, I didn’t know anybody who had a chin tattoo, whether Inuit, Gwich'in or any other group. I didn’t know anybody personally. I didn’t know that the Gwich'in had this tradition—I just didn’t know about it," she says. She says that her decision to get the tattoo is partly tied to its visibility, and that where once this was just a regular part of culture, now, as a revitalization, it’s a response to colonization and it’s lasting effects. Several women who have received their traditional tattoos have cited Yaari Walker as a woman who paved the way for them. Walker, originally from Savoonga on Saint Lawrence Island, had her chin tattooed at a tattoo parlor in Anchorage over 10 years ago. “My mother’s mother had both cheeks, her chin—she also had 11 stripes, that’s why I chose to do 11, because of my grandma. She had two lines going down her nose and her hands and her arms. So, I knew that eventually that I wanted to do tattoos,” Walker says. 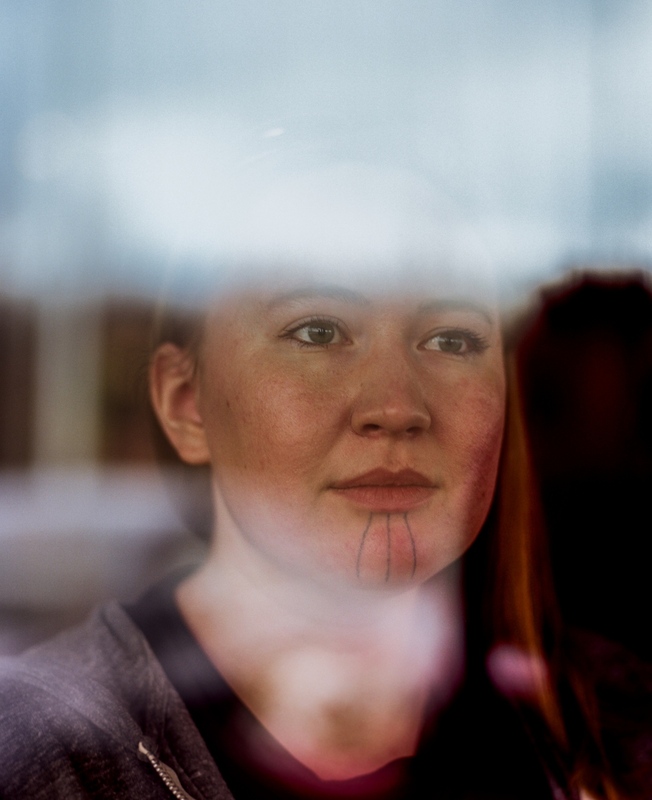 Stacey Lucason, 28, at Kaladi Brothers Coffee in Anchorage, Alaska, the place where, for the first time in her life, a stranger approached her and spoke to her in Yup'ik after she had her chin tattooed. Because she is an eigth Yup'ik, she says, she usually passed as non-Native, which often made her feel invisible. 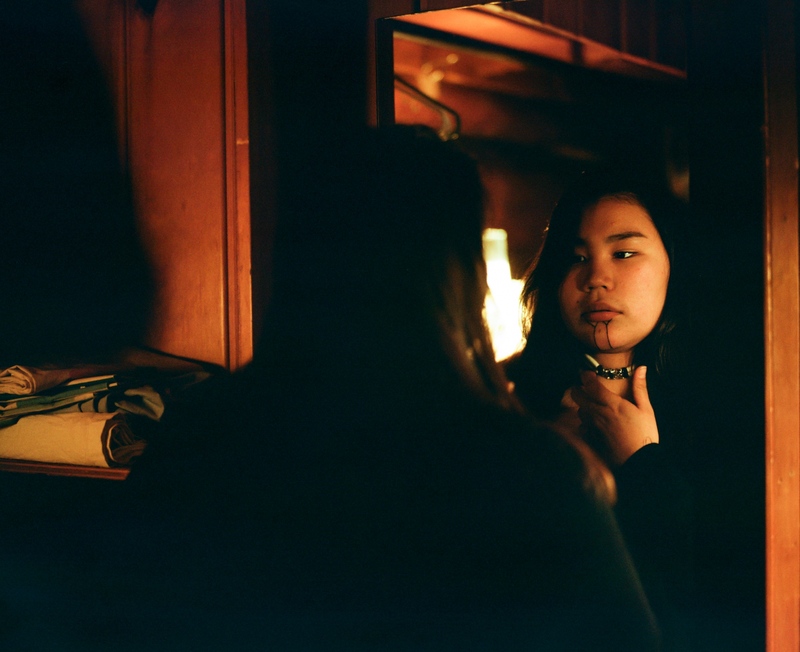 Lucason decided to have her chin tattooed right before graduating from the University of Alaska, a marker in life that felt like a modern-day coming of age to her. She had worn the lines on her chin in eyeliner for months before getting the permanent tattoo, and then was the first woman to have her chin tattooed by Holly Nordlum. 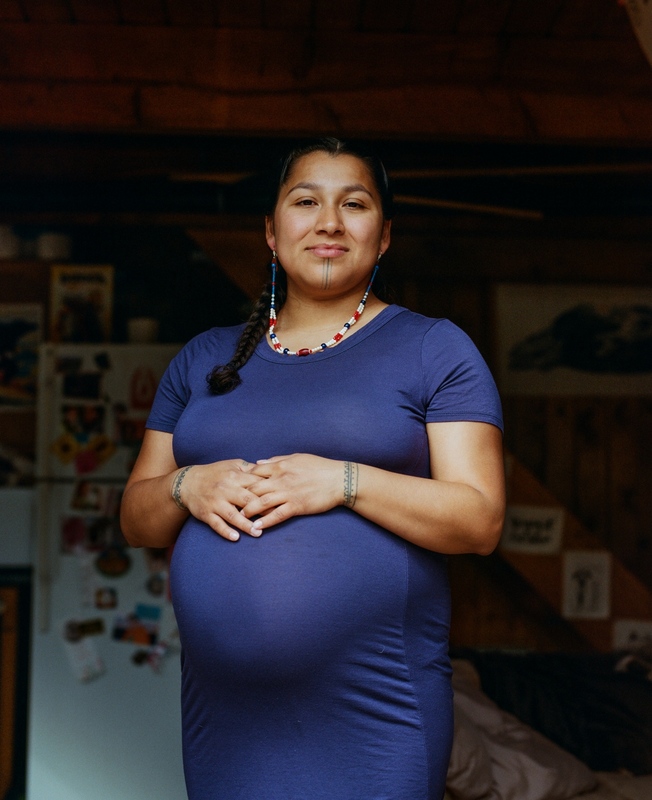 Denise Pollock, 28, who goes by her Inupiaq name Annauk, is an Inupiaq language teacher in addition to being the Climate Change Research and Policy Institue Director at the Alaska Center for Justice. Pollock says that there was a connection between getting her chin tattoo and speaking her language. “For me, one of the reasons why I chose to get my tavlagun was as a reminder for me to continue speaking, teaching, and learning the Inupiaq language. For me, it was about accountability. Whenever I look in the mirror, I know I need to speak my language," she says. Pollock also is an Inupiaq language apprentice, which involves meeting with an Inupiaq language mentor three times a week and studying and listening to Inupiaq ten to fifteen hours per week. "When I heard the story of Sassuma Ahrna who pushed back on what the norm was, on what tradition was, for so long and for women and against her culture a little bit--it resonated with me," Keegan Richards says. "I feel like she was a sister from another time. I liked her ability to just fight back. And in turn being more powerful than anyone gave her credit for, which is really empowering." The story of Sassuma Ahrna, which literally translates as Sea Mother, mother of the sea mammals, is that she was a willful young woman who refused all of the suitors presented to her by her father until one day, fed up with her stubborness, he brought her out to sea in a small boat and threw her overboard. When she grabbed onto the side of the boat to try to save herself, her father cut off her fingers. Her fingers fell into the sea and became all of the sea mammals, and she, in turn became mother of the sea mammals and resides in the ocean. The story goes that in order to have a successful hunting season, hunters must honor Sassuma Ahrna. Women get the markings on their fingers to honor her--the markings symbolize where her fingers were cut. 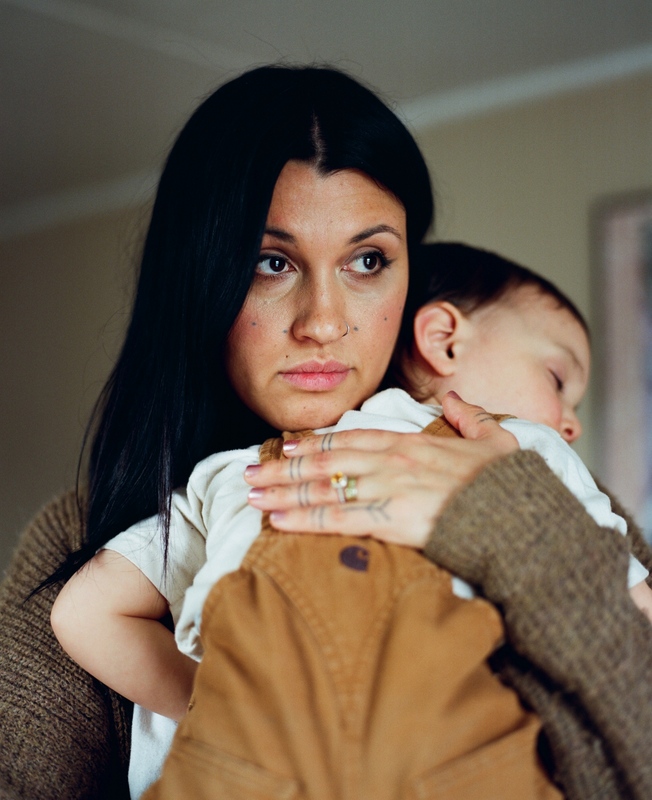 Keegan Richards holds her daughter, Estelle, 2, in her home in Anchorage, Alaska. Richards is a stay-at-home mom who also designs traditionally-inspired modern atikluks for her business Tundra Mama. Richards, Nordlum's cousin, has had multiple tattoos done by Nordlum, including the Sassuma Ahrna lines on her hands, dots on her cheeks, and most recently, chin lines. 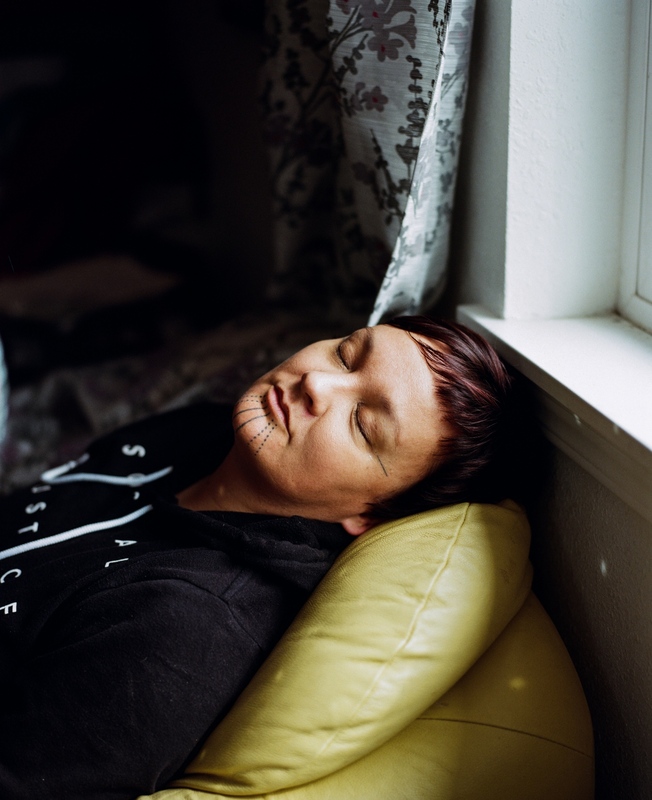 When she decided to do the dots on her cheeks even though they are not traditional to Inupiaq culture, she said a lot of it came down to understanding that the tradition itself is now something that's changed because it is a revitalization. "We now live in a Western world and things have evolved and changed, and while it is a traditional tattoo that is done in a traditional way, I feel that it is modern because I was able to look across the board and pick something that resonated for me and what I identify with and then come up with my own meaning for it. Because [the tattoos] all had different meanings and different families got different designs for different reasons. They all had their own story behind them. And because two generations of women in my family do not have these markings, I feel like we are at a place where you can start that tradition over again. And I can get these dots to represent 10 women in my life that have had an impact on me, past or present, that will continue to impact my journey. And maybe one day, my daughter will have a tribe of her own of amazing women and want to honor them in some way, and maybe it will look like this and maybe it won’t, but it opens the door for her to be able to do that." 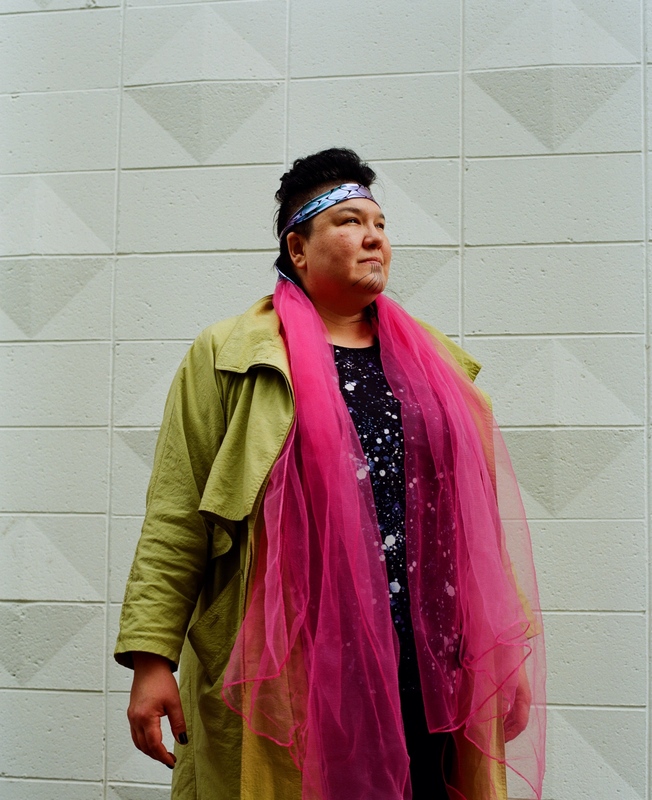 Allison Akootchook Warden, an Iñupiaq hip hop artist and performance artist also known as AKU-MATU, outside of her home in Anchorage, Alaska. Warden had her chin tattooed for the first time when she turned 40, and she chose a design done with color. "I wanted to do color because I thought that if my great-grandmother had access to color, she would have chosen color," she says. Warden had thought about having her chin tattooed for a while, she says, but decided to do it after her mother had hers done to mark turning 70. "My mom was marking that she was turning 70. And for her to get that done because she was a Presbyterian Minister sent a big signal I felt. Because she was trained in the church and she has a Masters Degree in Divinity, and she is a big leader in church. So for her to do that and show it so visibly, it was a big push for others I think—to say that it’s not something that is conflicting with Christianity. That it’s okay to have that part of our culture and it’s not something to be ashamed of or to put away. I got mine done a year after that," she says. "For me, it’s a process of decolonization. We have the right to wear these tattoos. I feel like there’s a strength in knowing who we are. There’s intentional decolonization. Creating spaces to decolonize and decolonizing ourselves." Holly Nordlum gives Jerrilyn Wellert, 18, a tavlagun, or traditional chin tattoo. Nordlum has been a voice at the forefront of a movement to revitalize the cultural practice of traditional tattooing, a practice that dates back centuries but was all but eradicated by missionaries in the 19th and 20th centuries. The chin tattoo is one that sometimes historically represented coming of age. Wellert, who is mother to a four-year-old son, said that she wanted to get it to show that she is proud of being Inupiat. She says that she has carried shame over not having fluency in her language even though growing up in a village, and that this represents a commitment to teach her son to have pride in his cultural heritage. Jerrilyn Wellert, 18, looks at her face in the mirror after receiving her chin tattoo. 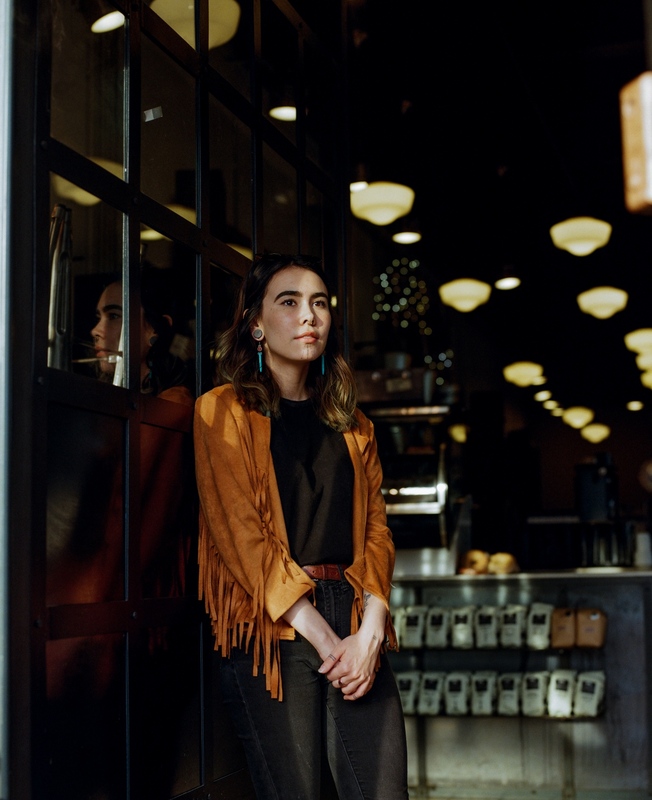 Orianna Greenberg, 21, in Black Cup, the coffee shop where she works as a shift manager and barista, in Anchorage, Alaska. Greenberg says that she grew up feeling a lot of shame about being Alaska Native, so much so that she often would tell people she was white. "I hated that part of myself," she says. "I stopped learning the language, I stopped dancing." Greenberg had her chin tattoo skin-stitched less than a year ago in Seattle by Nahaan, a Tlingit tattooist. 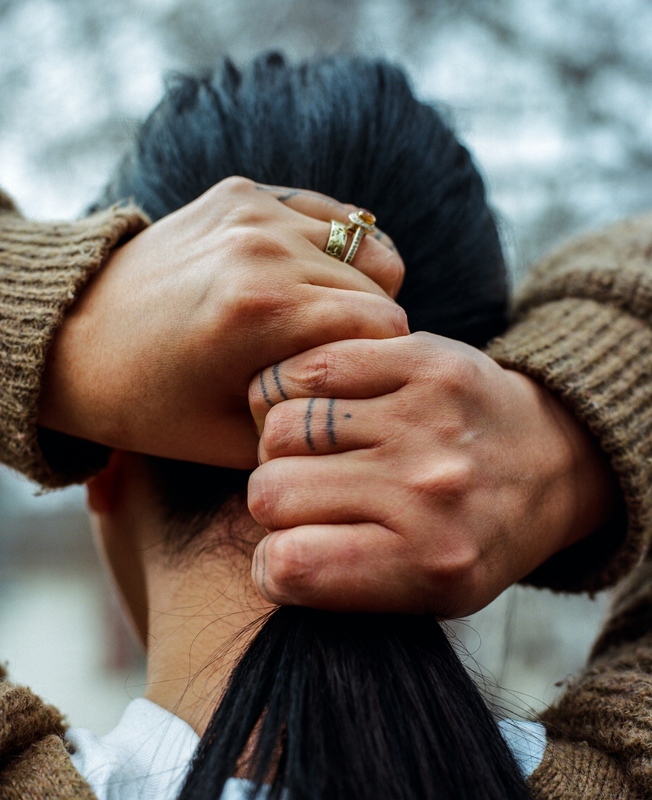 For her, she says that inititally, "the tattoo was kind of an apology to myself and my people and my culture and showing that I embrace who I am, that I love who I am. And from there it just kept going and became more about reclaiming my culture and empowering other people. It started off as more of a self-love thing and turned into wanting to inspire other Native women and reclaiming that." One of the things that this means for her, she says, is forgiving herself for shame that has come from internalized colonization. After having her chin tattoo skin-stitched by Nahaan in Seattle, Greenberg had Holly Nordlum tattoo Sassuma Ahrna lines on her hands. The story of Sassuma Ahrna, which literally translates as Sea Mother, mother of the sea mammals, is that she was a willful young woman who refused all of the suitors presented to her by her father until one day, fed up with her stubborness, he brought her out to sea in a small boat and threw her overboard. When she grabbed onto the side of the boat to try to save herself, her father cut off her fingers. Her fingers fell into the sea and became all of the sea mammals, and she, in turn became mother of the sea mammals and resides in the ocean. The story goes that in order to have a successful hunting season, hunters must honor Sassuma Ahrna. Women get the markings on their fingers to honor her--the markings symbolize where her fingers were cut. Danyal Harvey, 20, in her home in Anchorage, Alaska. Harvey was tattooed by Sarah Whalen-Lunn when she was 19 in Feburary 2018. She says that getting her tattoo was a decision that she spent a lot of time thinking about, but that once she did it, she felt like a more complete person. 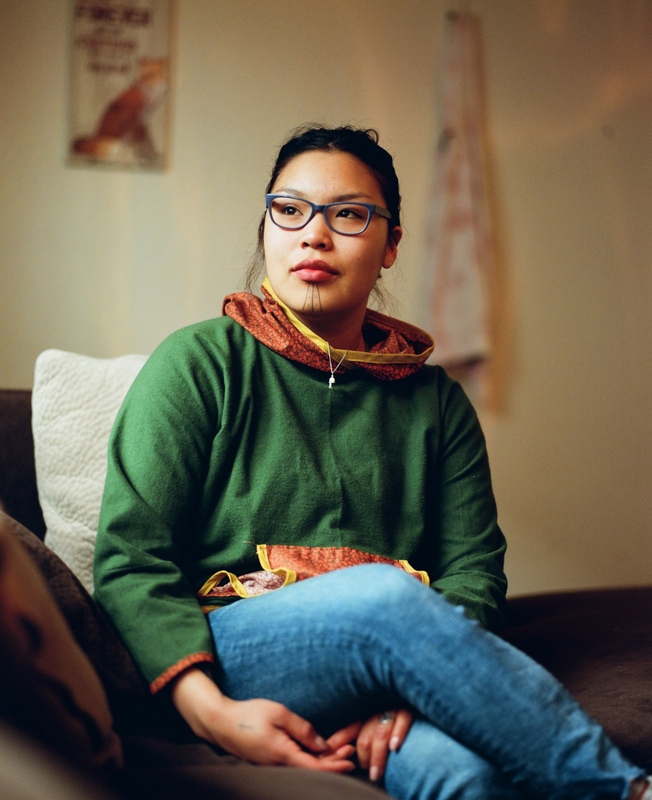 Her Inupiaq language instructors had the chin tattoos, and she says that when she first saw them, she thought, “these women are so beautiful and strong in their culture and they make me want to be better and learn more about my culture." Harvey grew up in the village of Noorvik until she was 7, but then spent life between Fairbanks and boarding school in Galena before coming to Anchorage. When she would return to the village for summers, she says that she often felt out of place. There have been some criticisms to her tattoo, she says, but not many. When she first posted about her chin tattoo on Instagram, a friend messaged her and told her that she shouldn't have gotten it, that she wasn't appropriately heeding tradition. "At this point, culture evolves," Harvey says. "This tavlagun to me means something different than what other ladies’ tavlaguns mean to them. I feel like people need to know that. That you do need to account for tradition. But when you’re trying to bring something back, it evolves." Keegan Richards hugs her cousin, Holly Nordlum, after Nordlum finished tattooing her chin.